Alex is a freelance writer, retail worker, short film maker, an avid lover of The Arts and always willing to explore. What I'm about to say has on more than one occasion conjured up the response "you have no soul", but I'll go forth and say it again anyway. 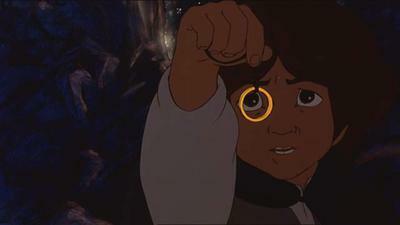 Ralph Bakshi's adaptation of The Lord Of The Rings is not only better than Peter Jackson's effort, but runs rings around anything this incredibly overrated director has made in the last sixteen years. I do realise I may have insanely outraged countless fans of "the trilogy" and Peter Jackson alike, and if this has put you off reading the rest of my review, please first hear my defence. I will admit Peter Jackson's The Fellowship Of The Ring was very well made, but it was his interpretations of The Two Towers and Return Of The King, that I had issues with. The upside of these films are it's great cast, locations and story, the downside is that Peter Jackson has issues coming to terms with the word "cut". I understand that people wanted more "faithful" adaptations of The Lord Of The Rings novels, but there is a reason directors cut scenes out of most book adaptations, that have the combined weight of small dumb bells. These unnecessary and boring scenes Peter Jackson insisted on filming, bring absolutely nothing more to film, and bring the rest of the trilogy's positive aspects down; sending it's already high level of pretention into overdrive. Did that anger you fans even more? Well keep reading anyway. For those of you who don't already know the story, we follow the journey of Frodo, an inexperienced young hobbit, who is suddenly thrown into a great deal responsibility. Frodo, along with three warriors Gandalf, Aragorn and Boromir are sent on a mission, to rid of an incredibly powerful ring that was formed by the dark lord Sauron. If this journey fails, there may be no hope to destroy the unspeakable evil riddled throughout Middle-Earth. 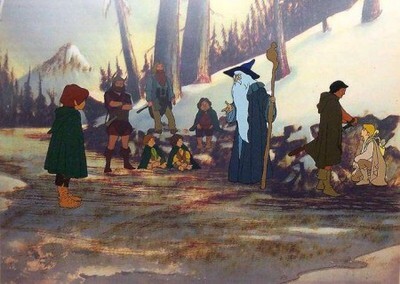 Ralph Bakshi's The Lord Of The Rings has been sadly overshadowed by the recent Peter Jackson films, and has never really been given the full potential it truly deserves. The most notable highlight of this film is one that is common with most of Bakshi's features, a uniquely weird and wonderful style of animation. Ralph Bakshi's wicked mind forms one of the most eerie and at times disturbing portrayals of The Lord Of The Rings ever brought to life; especially with the many moments featuring the soulless dark riders. The animation overall creates a mind tripping surreal sense throughout most of the film. 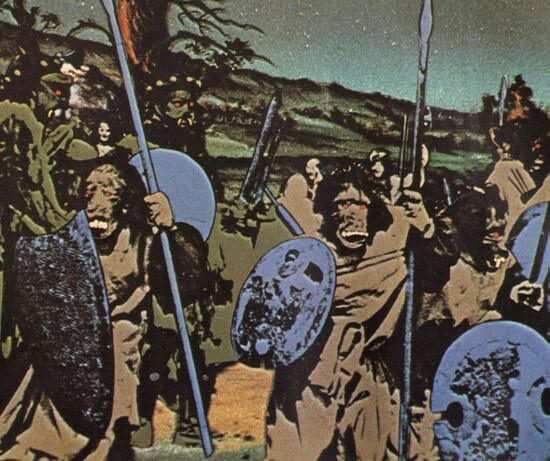 This effect that Ralph Bakshi applied is one that could not be easily matched in its greatness and more suitably placed amongst this classic tale with the likes of wizards, elves and hobbits. Another great aspect about Ralph Bakshi's The Lord Of The Rings is it's particularly smooth pacing. Of course, plenty of scenes had to be left out from the original books, and this is a topic that many of the fans degrade the film for compared to Peter Jackson's tedious adaptations. However as previously mentioned, some stories in one media do not work as well in others, and sacrifices often need to be made for a decent adaptation. Despite what many people say, Ralph Bakshi's The Lord Of The Rings was remarkably abridged to the big screen. Ralph Bakshi's portrayal of the trilogy however is not perfect and isn't without it's fare share of blaring downsides, such as losing it's steam occasionally through out the duration. This is nothing however compared to the most irritating aspect of this film, one in particular that has me cursing Chris Conkling (the screenplay writer) to this very day; that is the portrayal of Sam. My only explanation is that this horrible characterisation occurred for some sort of comic relief, however the only bigger blunder to compare this to is George Lucas's numerous attempts at humour with Howard The Duck. 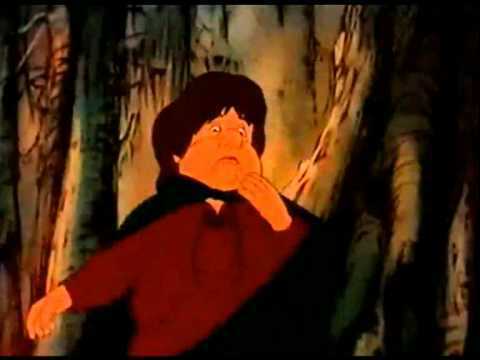 The portrayal of Sam both in the original novels and Peter Jackson's trilogy is a loyal, and kindhearted friend to Frodo; in Ralph Bakshi's version he's that too, but with an extra big dose of bumbling annoying idiocy. Another part that further brings this film down is the fact that this isn't a finished story. 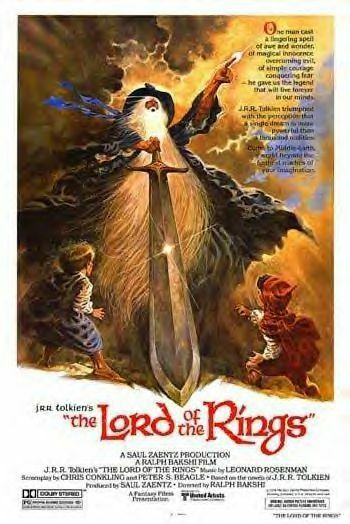 Sadly Ralph Bakshi's The Lord Of The Rings only covers the first half of the trilogy, leaving the other half still left unmade. Although it's hard to say that this is at all the fault of Ralph Bakshi himself, as United Artists for some reason refused to fund the second part that they had previously agreed to. Are you a parent wondering if this film is suitable for your young ones? 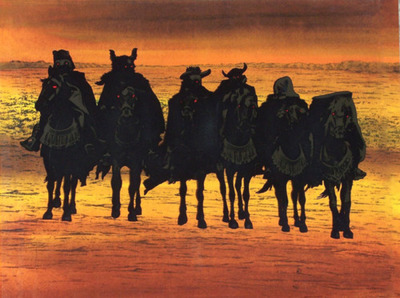 Ralph Bakshi's The Lord Of The Rings certainly does have it's fair share of dark moments, however the overall content especially concerning violence, is a lot more stylised and child friendly than Peter Jackson's adaptation. Overall, The Lord Of The Rings even with its negative points is still an artistically extravagant and impressive adaptation from the original trilogy. Whether you are a fan of Peter Jackson's work or not, this is a must see at least for the sake of comparison. You can purchase the DVD and BLU RAY at Amazon.